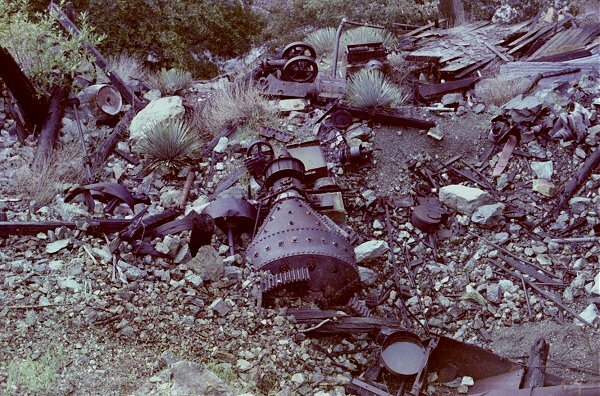 These pictures record my second attempt to climb Iron Mountain and my second visit to Allison Mine. The first time I wanted to climb Iron Mountain, it was blazing hot. I was completely out of water and energy at the turn-off to the mine, which I also wanted to see, so I made my destination the mine instead of the peak. The next time I vowed to pick an overcast day, and to take a lot more water. It was overcast -- in fact it started to rain as I approached the saddle. 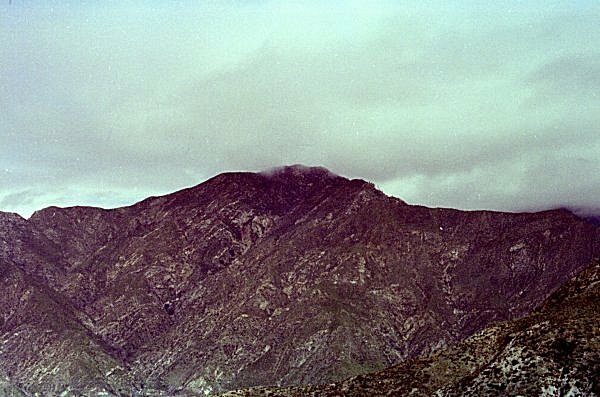 Then clouds enveloped the peak, and it started to thunder and lightning. So I opted again to make my way through the thick brush to the mine. 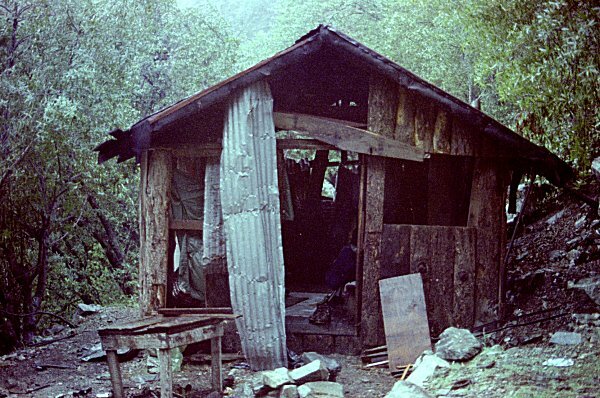 I was looking for a flat place to set up my tent, and instead I found this shack. It was pouring, so I went directly inside, lay down on my pad, and took a nap. A couple hours later, I woke up to find the rain tapering off. I moved my camp to the flat spot in front of the main entrance, and proceeded to explore the mine workings. This is some heavy machinery beneath the ore hopper, near the mine entrance. It amazes me that the miners could have gotten this heavy stuff up to the mine. The cone-shaped object in the center is a ball mill. It rotated along its axis, turned by the gears that are visible at its base. On its side is a door, and inside it is full of ball bearings the size of a fist. They have all been worn down like stones you would find in a streambed. This crushed the rock, one of the steps in the separation of the gold. 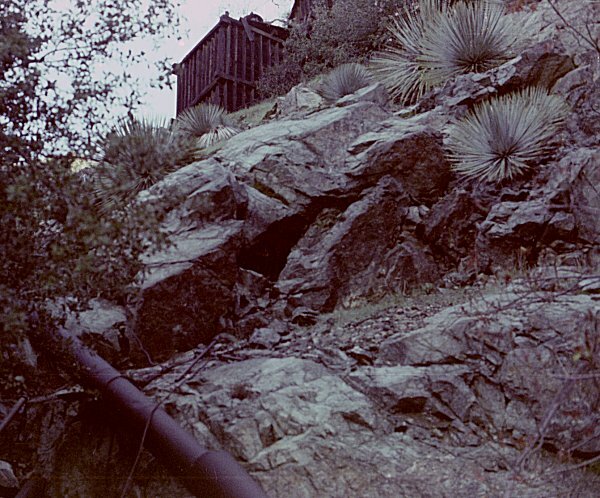 The ore hopper above was just in front of the mine entrance. 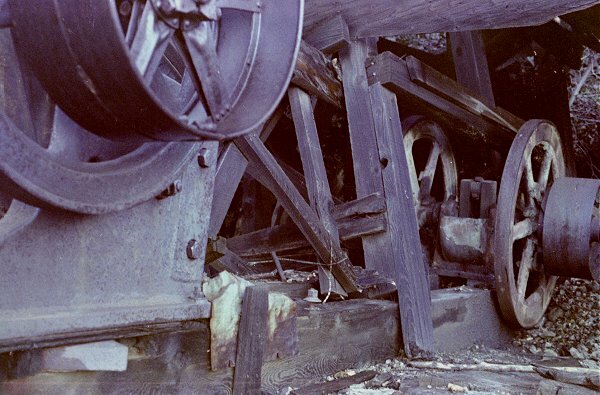 The picture was taken from below, in the vicinity of the ball mill. 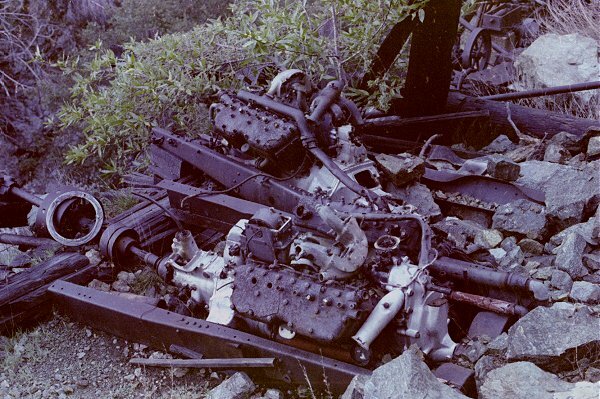 This appears to be the remains of a could of gasoline (or diesel) engines. Apparently these supplied the power for the various pieces of machinery. 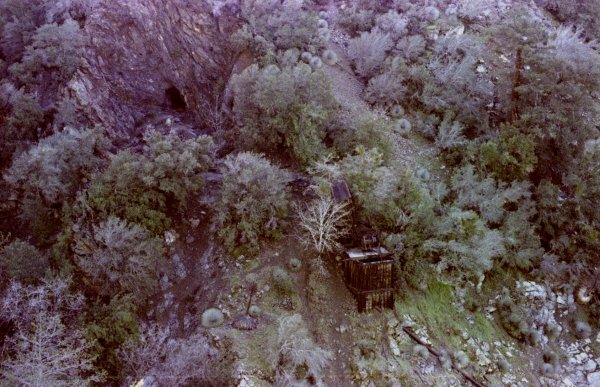 This shows the main mine entrance and the ore hopper from above and across the canyon. The pipes leading down go to the ball mill and other machinery. The shack is to the left and up the canyon a little way. What happened next is not documented in pictures. The next day dawned sunny and clear. After struggling through the thick underbrush all day, I decided to return by descending Allison Gulch to the San Gabriel River, and then hiking down the river to the trailhead. I had hiked up the San Gabriel many times, past Allison Gulch all the way to the Narrows, and I know it would be easier. I could see the beginnings of the trail, made by the miners, starting down the gulch. I had the idea that I might like to return to the mine by way of the San Gabriel and the gulch, so I took careful note of how to recognize the trail coming up the canyon. When I got to the San Gabriel River, I was a little concerned that I would get wet if I had to cross it. Luckily, I was already on the correct side. 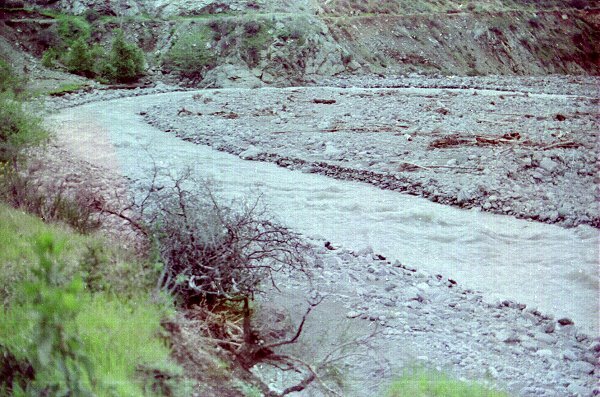 As I headed downstream, I quickly found that my side turned into cliffs, and I would have to cross. I doubled back, finding the widest, shallowest portion. The water was moving quickly, but was only a little above my knees. The day before, by the way, the water had been about ankle-deep. Well, I found out that knee-deep water, rushing at high speed over slippery rocks, is not something that I could walk across. I could stand (barely) but would be swept off my feet every time I raised a foot to take a step. I struggled with a pole, which allowed me to get a little further out before falling in face-first. I tried crossing just below a tree that stuck out across the river, but I found myself hanging on for dear life to the tree, my feet swept out from under me. I finally made it across by running as fast as I could, splashing in the water, and bouncing across and downstream a few times. Although this worked, I found that with a full pack, I was having a hard time keeping from winding up face-down in the water. OK, maybe I would have to cross only once more. I hiked downstream around a couple bends, past the cliffs that had stopped me on the far side, and down the river. Only four miles to go. After about half a mile, I could go no farther, and had to cross again. Again I splashed across, taking giant steps. Again I wound up face-down in the water, my pack getting heavier and heavier. My hat fell off into the water, and was instantly swept away. I had no idea how many more times I would would have to cross. Maybe this would be it -- I was now back on the correct side. Another few hundred yards, and I was again facing the prospect of having to cross. This would not do. I had to turn back. Instead of crossing back twice more, I found a way to climb high above one of the cliffs and to wade-swim upstream in a kind of eddy past another cliff, so I would not have to cross to the other side. I made it back to Allison Gulch at 3:00 PM. It had taken my eight hours of hard hiking to get here, and I had three hours of sunlight left. And a horrendously steep, trailless ascent to get back to the mine. Heaven knows how I found the strength to make it back -- adrenaline can be wonderful sometimes. Here is the San Gabriel River, near the trailhead. The colors are strange in the image because it was almost dark and I used the longest exposure and widest lens setting I could, and even so it was greatly underexposed. These images were produced from the original negatives. I had just bought my first good camera -- a 35mm SLR -- Olympus OM1. This trip was the first time I had taken it out of the house. I got it thoroughly soaked. Damn ! I took it to a camera repairman in a little office in downtown LA, and he cleaned it up and dried it out for me. It is still working to this day. The developing lab fouled up the development, however. Partway through, the film apparently got stuck in their machinery. One of the pictures had severe wrinkles and tears in it, and all the negative beyond that were seriously too blue. All the pictures on the roll had a blue cast, but after the jam, there was little else. I have done my best to correct them, but the results are not perfect. The last picture shows how part of the negative developed differently from the rest. From the rain, to the impossible stream crossing, to getting all my gear soaked, to having the pictures fouled up by the developer, this was truly a cursed trip. I realize now that I was really lucky not to have drowned.